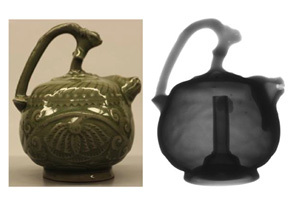 A three-dimensional radiographic exam of a modern Chinese Pythagoras cup was taken to reveal the simple structure of the cup that allows the siphoning mechanism to occur. The original Pythagoras cup was designed around 500 BC to teach its users to drink in moderation. If liquid is filled into the cup above a specific height, it all completely funnels out of a hole in the bottom of the cup and onto the drinker’s lap. At first glance, this painting appears to be quite normal. However, on closer inspection you begin to see faint signs of another woman who has been hidden and painted over. 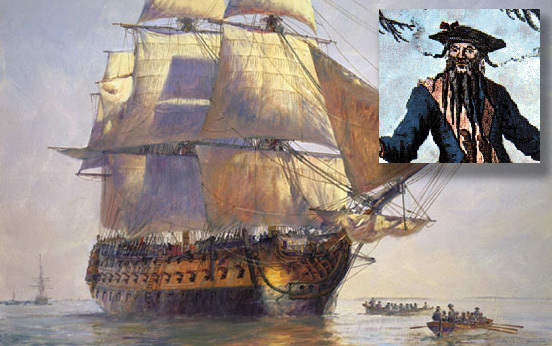 Working with the N.C. Department of Cultural Resources, the Digitome non-destructive x-ray imaging system is being used by Davidson College to exam encrusted relics from Blackbeard’s infamous pirate ship, the Queen Anne’s Revenge. The relics lay lost on the ocean floor off the N.C. coast for almost 300 years. Since geodes have closed surfaces, the only practical ways to view the inner crystals are to break them or to use a form of imaging that makes use of light outside of the visible range like x-radiography. 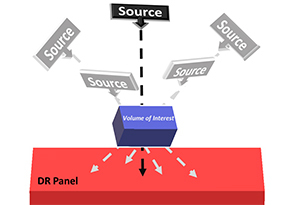 A Digitome volumetric exam is able to detect the contour of the void within the rock and identify areas of particularly low or high thicknesses in a non-destructive manner. A Digitome exam was taken of an Alaska quarter to see if the two separate faces could be isolated, and it was successful. One distinct layer of the coin scan reveals the grizzly bear springing out of a rushing river and biting his catch—a salmon. Moving down through the coin, the face of George Washington is clear, but analysis of the words reveals that the radiographic image face is actually a mirror image of the real face! Digitome is capable of accurate measurement down to the order of microns given a small focal spot size and low pixel depth for a digital image plate, typical conditions for high-resolution digital radiographs. This video demonstrates how Digitome measures objects in an exam; the objects used have well-known sizes to test the software’s accuracy. Request additional information about acquiring a Digitome system or request pricing for services. Digitome Volumetric Technology is built on patented view reconstruction from several images (typically 8-16) acquired from a plurality of angles—a two-axis regime. Various exam configurations are possible through careful application of geometric accuracy principles. Views are reconstructed directly from the exam images and are presented near real-time for analysis. *Digitome 3D x-ray imaging technology has been applied for decades, primarily in government, defense, and aerospace applications. There is a substantial archive of successful exams involving a wide range of materials and objects. The application software release is current; documentation, SDK and software escrow are established. There are five current patents. **A VRS-2400 Digitome product can be acquired or onsite exam services ordered. Site survey and/or requirements definition tasks are required to ensure that expectations can be met. Training and support is available, usually by phone or remote internet access. Consulting is also available on exam techniques for specific exam situations. *Cadogan Pot: This 2D x-ray image shows the inner tube of a lidless Chinese wine pot. The Digitome exam gives the tube diameter and outer wall thickness. 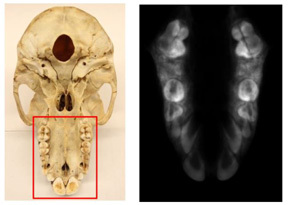 **Baboon Skull: Digitome exam reveals a layer of non-emergent teeth stacked on top of the layer of emergent teeth, indicating this baboon was a juvenile.